Added Underhill et al (2007a), Underhill et al (2007b) and Karafet et al (2008) on 4 May 2008. Added the following SNPs on 4 May 2008: 021355 (IMS-JST021355), M429, P69, P73, P85, P90, P97, P123, P124, P125, P126, P127, P128, P129, P130, P131, P132, P133, P134, P135, P136, P137, P138, P139, P140, P141, P142, P143, P144, P145, P146, P148, P149 P150, P151, P152, P153, P154, P155, P156, P157, P158, P159, P160, P161, P162, P163, P165, P166, P167, P168, P169, P170, P171, P172, P173, P174, P175, P176, P183, P184, P186, P187, P188, P191, P192, P193, P194, P195, P196, P202, P204, P205, P207, P209, P212, P224, P226, P227, P228, P229, P230, P232, P235, P237, P239, P240, P243, P244, P245, P255, P257, P260, P280, P281, P282, P283, P284, P285, P295. LLY22g is no longer in the root of N, but is N1 as of 4 May 2008. MEH2, P36 removed from Q and repositioned to Q1 on 4 May 2008. Added David Wilson as contact person on 4 May 2008. Changed BR to BT and CR to C,FT on 5 May 2008. Added U20, U21, U27, and U33 to Haplogroup G on 9 May 2008. Added P245 as a provision snp to P on 9 September 2008. Added L15/S137 and L16/S138 on 20 October 2008. Changed contact person from David Wilson and John McEwan to Whit Athey on 23 October 2008. Revised naming conventions: CT now CF; C,FT now C,F on 10 November 2008; explanatory note to be posted later. Added M370 to H on 21 December 2008. Removed P245 and S25 from P on 23 December 2008. 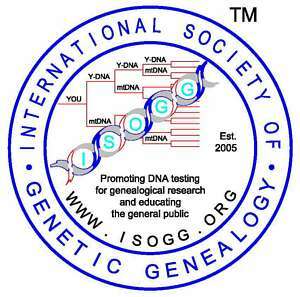 Copyright 2007, 2008 International Society of Genetic Genealogy. All Rights Reserved.